At the end of the first round of this musical showdown, Marvel Comics was up 3 to 2 after Superman and Spider-Man battled. Let’s start round 2 with another giant in the field of superheroes. The Caped Crusader. The Dark Knight. The World’s Greatest Detective. Call him what you want, Batman is one of the most beloved comic characters of all time. His first live action incarnation was in the form of serials. The first serial, from 1943, actually introduced the concept of the Batcave, and influenced the appearance of Alfred who had been drawn as overweight prior to this. 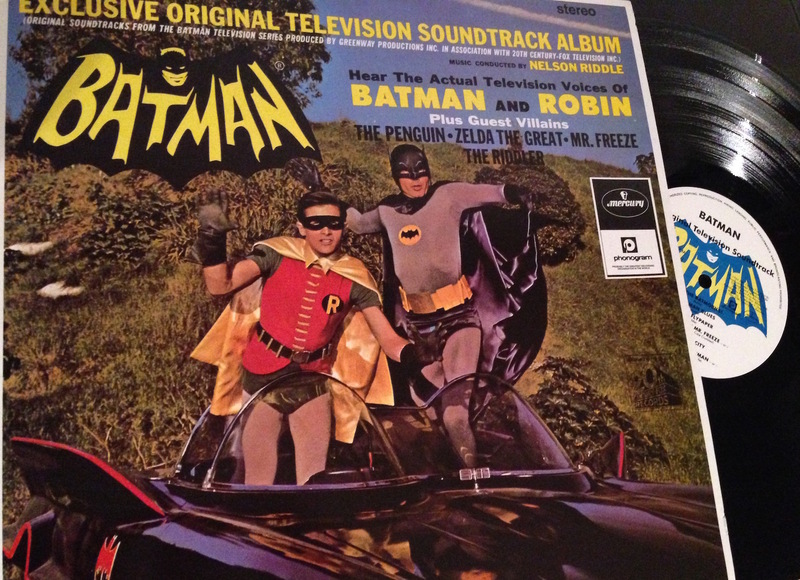 Musically, nothing memorable came out of neither “The Batman” nor its successor “Batman & Robin” that followed in 1949. But in 1966, Batman and Robin headed for the small screen with a widely popular TV show that aired for 3 seasons, plus a movie that was released in between seasons 1 and 2. While the show’s campy tone derailed the character for a few years, its swinging 60’s musical score remains a fantastic body of work, especially its famous Main Theme by composer Neil Hefti. A soundtrack album was released at the time, featuring narration and the voices of the main actors, but just a few of the incidental music. The score to the movie (by Nelson Riddle) was released twice as limited editions, once by Filmscore Monthly, and again by Lalaland Records. Both are sadly out of print. The show’s theme is definitely a slam dunk, and has been covered many times by artists as varied as The Who and Voivod. The Nelson Riddle score to the movie is also wonderful, especially its main title. It has the same jazzy approach as the show, but works so well with the tone of the movie. It incorporates elements of Hefti’s theme, but stands on its own. Fantastic piece of music. Another point awarded. The camp version of Batman stayed for a long time in the public’s mind, despite the fact that the comic books quickly went back to a more serious tone. The early 70’s Denny O”Neil/Neal Adams stories brought the character back to his detective roots, but in the 80’s, Frank Miller’s The Dark Knight Returns created quite splash with his grim and violent vision of an aging Batman. This release triggered a revisionist wave that brought a darker vibe to many heroes. The stage was set for a dark, gothic Batman film. In 1989, director Tim Burton released his Batman movie, played by Michael Keaton. For the music, he turned to his usual collaborator, former Oingo Bongo leader Danny Elfman. He was a bold choice, considering Elfman’s lack of experience of blockbuster films, but he went on to create (with the help of orchestrator Shirley Walker) a classic score that influence super hero music for the next decade. The Batman theme he created became the blueprint for moody superheroics, and indeed he would be hired many times to reproduce this blueprint. A true classic. At the time that Batman was released, if you’d asked most people who made the film’s music, they would have answered: Prince. Prince wrote a collection of songs for the movie that were released on a high profile album feature the film’s logo. Once the movie came out, people realized just how little of Prince’s music had made it to the movie, but Batdance (and its bat-themed video) was a hit that summer. Still, no points awarded for this. Batman: The Animated Series ran on Fox from 1992 to 1995, and traced its inspiration back to Tim Burton’s movie and its sequel Batman Returns, as well as the Fleischer Superman cartoons from the 30’s. The producers turned again to Danny Elfman to pen a Main theme that would set the tone for the series. Elfman brilliantly came up with a theme that can be used as a B section to the movie theme, and elements from both were used throughout the series in the score. The series was scored by Elfman orchestrator Shirley Walker, as well as a team of other composers. While the music for the show was fantastic throughout its run (and most of it is available through Lalaland Records), I’ll focus on the main title for this list. Notice how smoothly the ascending arpeggio from the movie theme fits in the B section? Score another point for DC. The animated show also spawned a movie, Batman: Mask of the Phantasm that was scored by Shirley Walker. Her Main Title music is splendid too, but I’ll refrain from awarding extra point because it reuses material from the show. For the 3rd and 4th movies of the franchise, Tim Burton was out, Michael Keaton was out, and so was Danny Elfman. Elliot Goldenthal took over composing duties, and the movies veered back into camp worthy of the 60’s TV show. Goldenthal introduced a new main title that fits in stylistically with what Elfman did. I love the triumphant ending! The music was a high mark for these two movies that did not have that many redeeming qualities. The franchise petered out after Batman & Robin, and sadly no soundtrack was released for the film other than a song compilation. Unfortunately, the songs for both films had no link to the Batman character, so I’m not considering them for this list. But Goldenthal’s score is another hit for DC. People thought Tim Burton had made Batman dark, but when Christopher Nolan’s Batman Begins came out in 2005, rebooting the franchise, he made the character ever more tortured. On the music side, out were the heroic melodies, and in were more ambiant pieces. The scores, by Hans Zimmer and James Newton Howard were quite effective in the movie, but a lot less as a separate listening experience. Of the three movies (Batman Begins, The Dark Knight and The Dark Knight Rises), few pieces stick out to me, and Zimmer’s two note Batman “theme” shortchanges the character in my opinion. Here are two tracks I do like from the trilogy. Still, considering how iconic the music was in the preceding examples, I can’t award a point. But just to show how much music can influence the tone of a film, here’s a sequence from Batman Begins, scored with Danny Elfman’s music. It makes quite a difference, doesn’t it? Woah, Batman has had a lot of great music over the years. Can Marvel catch up? The Iron Man franchise has been a great success for Marvel, and the character has also served as an integral part of The Avengers. But a lot of people will remember the superhero cartoons called The Marvel Superheroes from 1966 that featured Iron Man, Captain America, Thor, Sub-mariner and Hulk, each with their own theme music. Iron Man’s theme was a lounge, swinging tune that morphs into a fanfare. I have a lot of fond memories of those cartoons, but I’m not sure this tune warrants a point. let’s just say it hasn’t aged well! The character made guest appearances in a few cartoon series, and even got his own in the 90’s, along with most of the Marvel Universe it seems. But Iron Man really appeared in the general public’s consciousness with the film series that debuted in 2008, with Robert Downey Jr in the title role. All 3 movies had a different composers: Ramin Djawadi, John Debney and Brian Tyler all put their own stamp on the franchise. Djawadi and Debney’s scores were serviceable, but for the third movie Tyler was asked to create actual themes, and in my mind it created the best Iron man score. The main theme is used across the score in various forms, but it is during the end credits that it really shines. Arranged as a 70’s cop show/kung fu movie theme and now titled “Can You Dig It?”, it carries all of Tony Stark’s swagger and confidence. I loved that theme so much the first time I heard it that I even blogged about it at the time! Score one for the man in the iron suit. To be continued in Part 3, with Wonder Woman, Captain America, The Avengers and The Flash!